Bruno Mars is an 11-time GRAMMY winner and international star. Mars has 23.7M YouTube subscribers and 42.4M Twitter followers. In July 2010, Mars’ “Just the Way You Are” was released as a debut single. In 2011, Mars’ “Just the Way You Are” received the Male Pop Vocal Performance GRAMMY award. 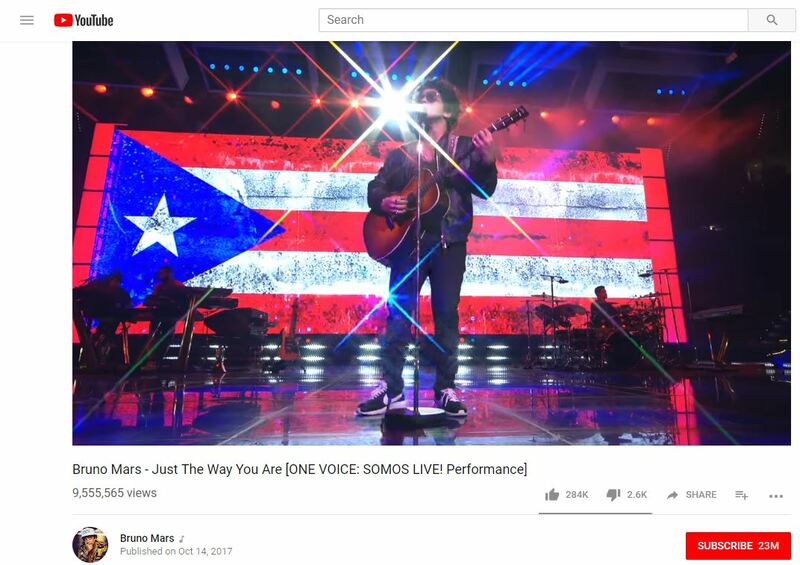 Mars surprised fans by performing “Just The Way You Are” in Spanish and playing acoustic guitar at the One Voice: Somos Live Concert for Disaster Relief. Mars’ brother, E-Panda, plays the drums. This video has 9.5M YouTube views. Bruno Mars’ “Just the Way You Are” sold over 10 million copies. After Mars’ single achieved this feat, the RIAA certified it as a Diamond single. In addition, “Just the Way You Are” is 2x-Platinum certified in the United Kingdom.